Of all the dessert pies, Apple Pie is one of my favorites, anytime of the year. 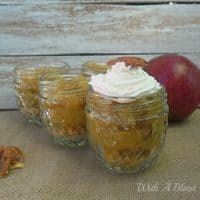 These Apple Pie Jars are just so much easier and quicker to make and it still tastes like a slice of the real deal. Apple Pie can be served with any of your favorite toppings, whipped cream, drizzling cream, ice-cream, with a crumble or custard (and I know there are a lot more, which I am not thinking of now!). Soft, syrupy and so full of spice, it is always a winner. We always have these Apple Pie Jars slightly warm, except for my daughter, she prefers any kind of fruit to be served cold. Normally even sweet, buttery fruits would be a no-no to her – cold or not, but she does enjoy these little Pie Jars.
) Divide the chopped Biscuits between 4 serving jars or bowls.
) Melt the Butter, Honey, Cinnamon, Nutmeg and Salt over low heat in a medium saucepan.
) Add the Apple to the saucepan and stir to cover – simmer over low heat for 20 – 25 minutes or until the Apple is very tender.
) Remove from stove – stir in the Ground Almonds – spoon, with the syrup, into the jars/bowls over the biscuits.
) Top with Whipping Cream and Pecan Nuts. Leave to stand a few minutes in order for the syrup to soak into the biscuits. These look delicious, and they are so cute! Yum and quick & easy winner in my book! Yum, yum, yum!! 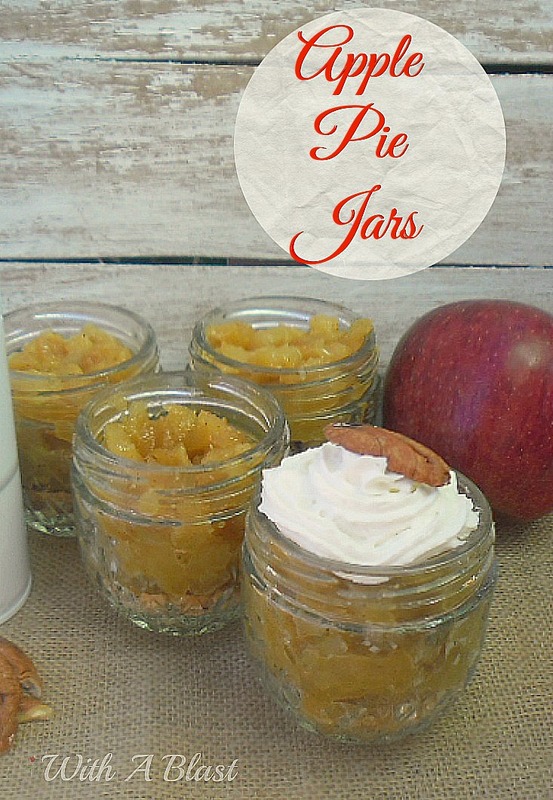 Love little treats in jars, and apple pie is an awesome idea. Oh wow! This is a great idea for a party. ohhh easy and delish! 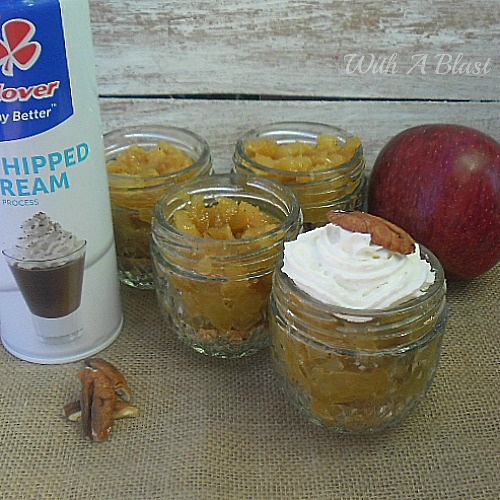 Love these little apple pies in a jar and will be trying them soon! This is great! So much easier than making a pie. Can't wait to try this out! I can't wait to try these! I pinned! This looks so good, pining!!! What a great idea, and not to hard for someone like me. Love it. What a cute little dessert. Individual servings always seem so much more special. Apple pie is my favorite pie too. 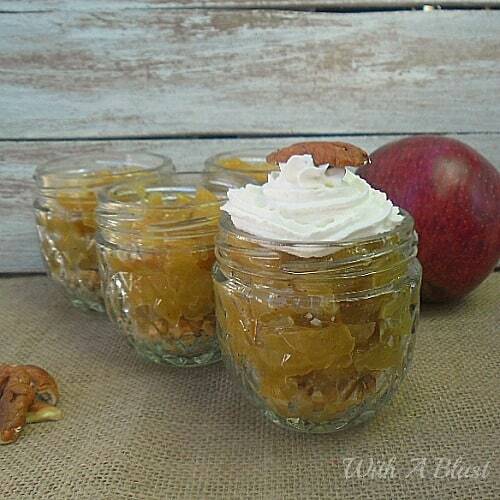 Apple pie jars looks cute looks very nice, thanks for sharing with Hearth and Soul blog hop. pining. Yum! 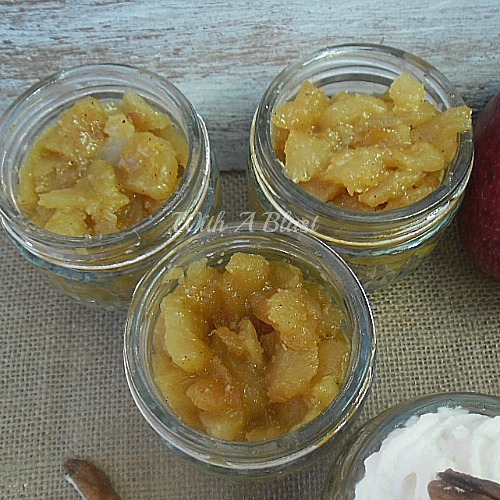 Apple pie in any form sounds delicious, but in the jars looks so cute. Thanks for sharing at On Display Thursday!